About the Lawyer: Diana Stetiu is a Romanian law qualified lawyer, holding a law degree and an LLM degree from the University of Paris I: Panthéon-Sorbonne, France. Diana is a Senior Associate leading the Tech law practice with Bulboaca & Asociatii, she is also a member of the Banking & Finance and Capital Markets team. This article is published as a general overview and, it is not intended to – and should not – be relied upon as legal advice. My references to U.S., Swiss and German law are based solely on consideration of legal principles and not any legal experience on advising clients on U.S., Swiss, and German law. Question 1: The buzz around STOs is growing. What do you think is their potential? ANSWER — Anything that is considered today by applicable laws as a security (e.g. shares, bonds, debentures, notes, options, warrants) can be tokenized, therefore, the potential of security token offerings (“STOs”) is huge. Tokenization is the process of converting rights of any asset into a digital token on a blockchain and issuing the same to the public. From now on, we will be definitely hearing a lot more about the STOs because they have the potential to become the market standard form of funding for both startups and well-established companies that want to tokenize their securities offering instead of listing them on a stock exchange. Compared with traditional initial public offerings (“IPOs”), STOs could become IPOs’ real competitor since the costs for an STO remain cheaper. Also, the companies and investors may prefer digital tokens over conventional securities because trading security tokens in the secondary market through licensed security token trading platforms can be much more attractive for investors who want to quickly liquidate their security tokens. Security tokens could enable a totally new world of finance where: fees are lower, increased settlement times make deals to be executed faster, market friction is reduced, and securities have more complex structure. Question 2: Security tokens are asset-backed tokens and represent a claim to an asset. What benefits can an STO provide to the investors? ANSWER — I would point out that nowadays, in the world of cryptocurrency, maybe one of the most pressing questions is how regulatory authorities will treat various digital assets. It is indeed hard to classify tokens from a legal perspective because there are different economic realities of tokens. A token’s characteristics and the manner in which the token is sold drives the determination as to whether securities laws of various jurisdictions may be applicable. All regulatory authorities should be aware that the biggest risk is not the lack of regulation, but rather overregulation or bad regulation which may kill the development of revolutionary products. Within the European space, the Swiss and German regulatory authorities manifested the strongest interest in providing guidelines on classification of the tokens, however, clear guidelines on how to classify tokens or information on when a token will not be regarded as a security have not been yet provided. Thoughtfulness around STOs increased in February 2018 when the U.S. Securities and Exchange Commission chairman Jay Clayton said: “I believe every ICO I’ve seen is a security”. (b) “purchasers would no longer reasonably expect a person or group to carry out essential managerial or entrepreneurial efforts”. According to the Swiss Financial Market Supervisory Authority (FINMA) security tokens named ‘asset tokens‘ represent a specific asset or claim, in particular, a debt claim against the issuer or an equity position/ corporate membership right in the issuer. This makes them broadly similar to traditional securities. In February 2018, the German Federal Financial Supervisory Authority (BaFin) issued a guidance note explaining the circumstances under which tokens sold via ICOs are financial instruments. (iii) a capital investment within the meaning of the German Capital Investment Act. (iii) any other claim comparable to (i) and (ii). If the tokens are financial instruments, this means that trading platforms, investment advisers, brokers, portfolio managers or custodians who trade in, advise on, intermediate, manage or store tokens become subject to the MiFID II. As a consequence, they will need a license and will be supervised by the BaFin. In terms of investors’ benefits, if one compares STOs with IPOs, there could be some major benefits for an investor. Security tokens allow companies to divide underlying assets into smaller units, enabling fractional ownership which makes the investment more affordable for retail investors and the token easier to transfer on the secondary market. STOs may facilitate investment for global investors looking to make a good return with greater liquidity. From another point of view, if one compares STOs with utility tokens (According to FINMA “utility tokens are tokens which are intended to provide access digitally to an application or service by means of a blockchain-based infrastructure”. )sold in an ICO, I don’t think that STOs could provide much for token purchasers but rather one (main) benefit: purchasing tokens from companies adhering to all securities laws and regulations within the jurisdictions where the security tokens are sold, ensuring a better protection to purchasers. (iii) the company has competitors and how they may impact on the issuing company’s project. Question 3: A lot of excitement is felt around Regulation S of the USA. What is your take on Regulation S as a fund-raising avenue? ANSWER — As a rule, if a token (also) represents a regulated security, then the offer, sale, promotion, and listing of the same may be a regulated activity unless relying on specific exemptions. Under U.S. law if a token is a security, it can be offered to U.S. investors provided that the offering is registered with the SEC or fits into an exemption. Briefly, Regulation S provides an exclusion from the Section 5 registration requirements of the Securities Act of 1933, as amended (the “Securities Act”), for offerings made outside the United States by both U.S. and foreign issuers. 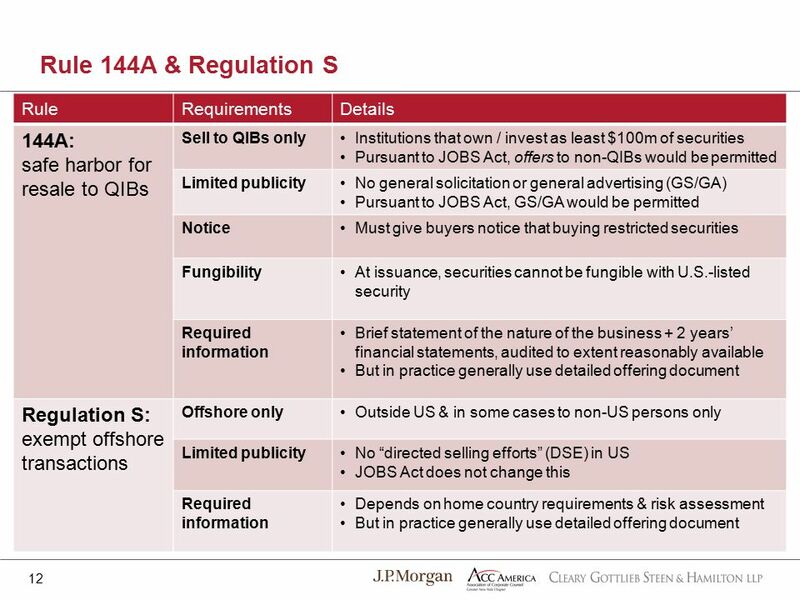 Under Regulation S, issuers may offer securities to non-US investors in offshore transactions without registration, as long as the offering complies with the provisions of Rule 903 of the Securities Act. (ii) no “directed selling efforts” may be made by the issuer, a distributor, any of their respective affiliates, or any person acting on their behalf. As mentioned above, upon the characteristics of the token and how the token is sold, a token sale may be a security offering requiring registration or an exemption therefrom. In fact, many companies which launched ICOs have utilized the exemptions from registration provided by Regulation S and Regulation D (i.e. offerings to accredited investors) to sell securities just because this is the trend in the market, disregarding that these exemptions are subject to various limitations. 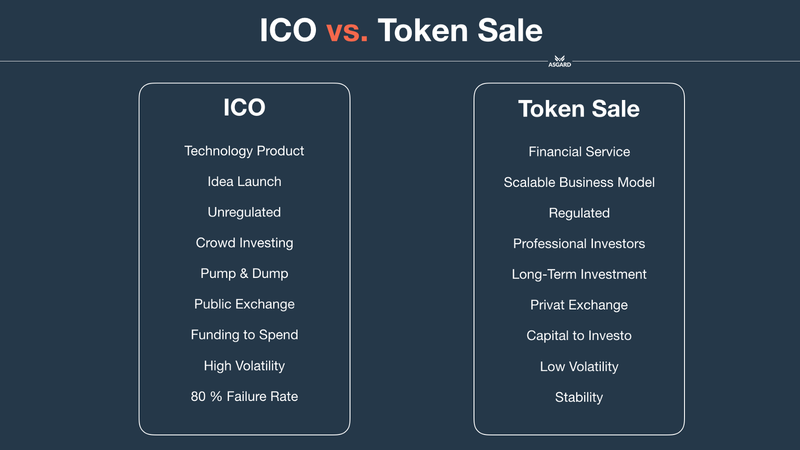 Firstly, companies launching ICOs should assess whether the securities laws will apply to their token sale and, if so, which of the offering structures the best suit their objectives. Secondly, they should analyze whether Regulation A (Regulation A is an exemption from registration for public offerings. Regulation A has two offering tiers: Tier 1, for offerings of up to $20 million in a 12-month period; and Tier 2, for offerings of up to $50 million in a 12-month period.) or a registered offering is a better alternative, particularly if their target is to sell securities to a larger number of purchasers with higher liquidity for secondary transactions. Nevertheless, these companies must also observe the security regulations of each country where they offer their security. Question 4: We’ve seen several ICOs file for Regulation S exemptions. Should ICOs hedge their bets and increase their compliance or should they take the STO route? ANSWER — This question does not have a yes or no answer. It requires a careful analysis. Actually several companies rather than dealing with the uncertainty of whether their ICO passes the Howey Test, they just chose to exclude U.S. investment altogether. In my opinion, companies should conduct a legal analysis on their token and then, if the conclusion is that a securities procedure or another licensing process is needed, choose the country where they wish to start according to their intended objectives. Although a token is not a security, depending on how the ICO is structured, it could qualify as an alternative investment fund to the extent that it is used to raise capital from a number of investors, with a view to investing it in accordance with a defined investment policy. Also, potential links to collective investment schemes legislation may arise where the assets collected as part of the ICO are managed externally. Question 5: The definition of an accredited investor and investors’ protection regime is different in many jurisdictions. How can an STO ensure KYC compliance in light of differing jurisdictions? ANS —When considering a cross-border offering in various jurisdictions, it is essential to establish whether that offer of securities is lawful to all relevant recipients. In EU, ‘qualified investors‘ under Prospectus Directive (Directive 2003/71/EC of the European Parliament and of the Council of 4 November 2003 as amended by Directive 2010/73/EU of the European Parliament and of the Council of 24 November 2010.) / Prospectus Regulation (Regulation (EU) 2017/1129 of the European Parliament and of the Council of 14 June 2017 on the prospectus to be published when securities are offered to the public or admitted to trading on a regulated market, and repealing Directive 2003/71/EC.) or ‘professional clients‘ and ‘eligible counterparties‘ under MIFID, are, let’s say, “synonym” with the U.S term ‘accredited investors’. These terms differ in relation to the actual rules, but they all serve to protect investors from risky investments. According to the European Securities and Markets Authority (ESMA), for offerings of tokens that are considered to be transferable securities, compliance with the Prospectus Directive and/or Prospectus Regulation would be required. These pieces of legislation aim to ensure that adequate information is provided to investors by companies when raising capital in the EU unless certain exclusions or exemptions apply. In my view, token security issuers must check the full ambit of legislation of each targeted jurisdiction that may be relevant to the carrying on of regulated activities, the publication of a prospectus and the making of financial promotions, as well as anti-money laundering and data protection legislation. Also, ICOs irrespective of the type of token should voluntarily ensure compliance with Know Your Customer (KYC) and Anti-Money Laundering (AML) regulations if issuers want to make their token purchasers feel safe, putting their crowdsales into a legitimate light. Question 6: SAFTs have originated from SAFEs and have no legal backing yet. Do you think SAFTs are a good route? ANS — Using a Simple Agreement For Future Tokens (SAFT) is a popular U.S. strategy of companies attempting to mitigate the risk of utility tokens being deemed securities. (ii) once the token marketplace is functional, the tokens delivered to the same investors gained inherent utility and, thus, the tokens can be further sold on exchanges to non-accredited investors. If prospectus exemptions are subject to resale restrictions than such restrictions should be observed. Simply using a SAFT is not a safe way of getting compliant with securities regulations. Attention should be paid to the manner of sale, token purchasers’ expectations and consumptive aspects of the token. Question 7: How can Blockchain help disrupt the legal industry? ANS —Legal industry may be changed substantially thanks to blockchain technology. Many challenges that governments are currently dealing with in keeping and protecting public documents could be solved by the blockchain. For example, in many emerging countries, land ownership is often an area of disputes due to lack of conclusive proof of ownership or impossibility to establish a chain of title. The blockchain is an ideal technology for any industry that stores information, hence for the legal industry as well. In some civil law legal systems, it is very important for the buyer of a real estate asset to conduct a due diligence regarding the chain of title ownership. The perfect proof of ownership tracing up all prior transactions to the first owner is most of the time difficult or impossible, actually a probatio diabolica. Blockchain-based land registries may significantly reduce the cost and time required to buy and sell real estate. Also, currently, in many transactions, notary publics need to confirm and verify signatures on documents. Using blockchain technology, documents can be kept digitally as part of a digital ledger, applying “timestamps and fingerprints for media files” eliminating in this way the need for the wet ink signature or rubber stamp of today’s notary public. The blockchain is going to have an impact on how we do business. The law follows economics. So, the disruptive effect of blockchain will definitely impact the legal industry in many other ways. Question 8: Legal agreements can be amended but smart contracts are immutable. In that light, will Ethereum Blockchain with its immutable smart contracts give more confidence to investors or should we switch to Stellar for STOs? ANS — There are pros and cons in case of both Stellar consensus protocol and Ethereum blockchain. Ethereum has a great Turing complete smart contract programming language so it can do much more than Stellar. Nevertheless, one may consider the Turing complete smart contracts prove out to be more “counterproductive than useful for those ICOs that do not need a Turing complete smart contract language in the first place”. Like almost anytime, the answer to this questions depends. For example, if based on Regulation D exemption, a company accepted in its ICO U.S. token purchasers, they would need to ensure preventing the purchasers from selling the tokens in the first 12 months. In such a case maybe Ethereum smart contracts could be of more help than Stellar protocol. One of the most important requirements for issuing a regulatory-compliant token is being able to control who can own that token at all times. I think investors’ confidence likely relies on some other factors like the adoption of a product. ICOs have traditionally been launched with ERC20 tokens on the Ethereum network. For conservative purchasers of security tokens, ERC20 tokens may remain their first choice.